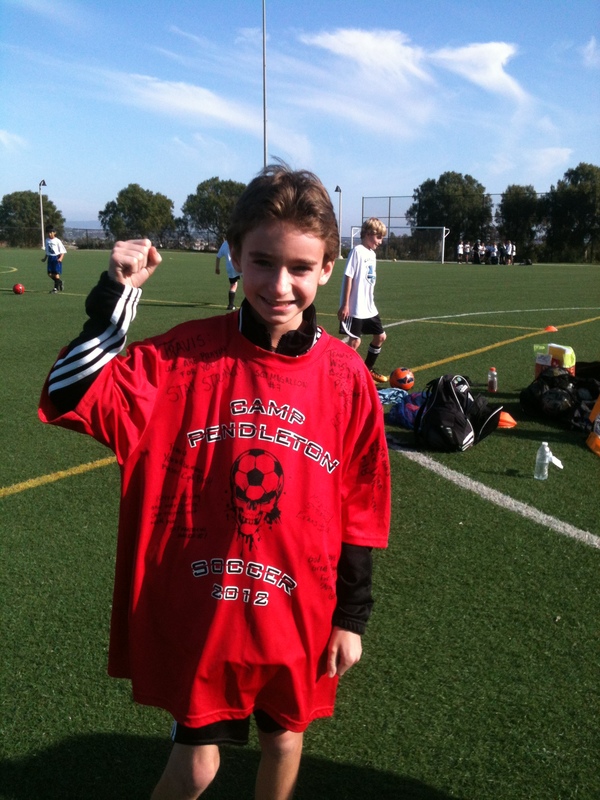 Stitches are Out and Soccer Practice 3/27/2013 | Travis the Warrior --- Kickin' Cancer! This morning we had our appointment to have Travis’ stiches removed and will be the last time we see the neuro-surgeons for several months. Nothing personal Dr. Levy and Dr. Sack but that is a good thing! Travis (and Lynne) went to school again today for more than 3 hours. Lynne has been staying with Travis while he is in school so she has been getting a lot of classroom time. It helps since she will be the one to be working with Travis on his schoolwork while they are in Houston. Mrs. Roberts has been preparing packets of work for us to take so that Travis can stay up to speed. It is not easy being a fourth grader! Travis has been missing playing soccer lately and hadn’t seen his buddies in a while so he wanted to go to practice today to say hi to the guys. 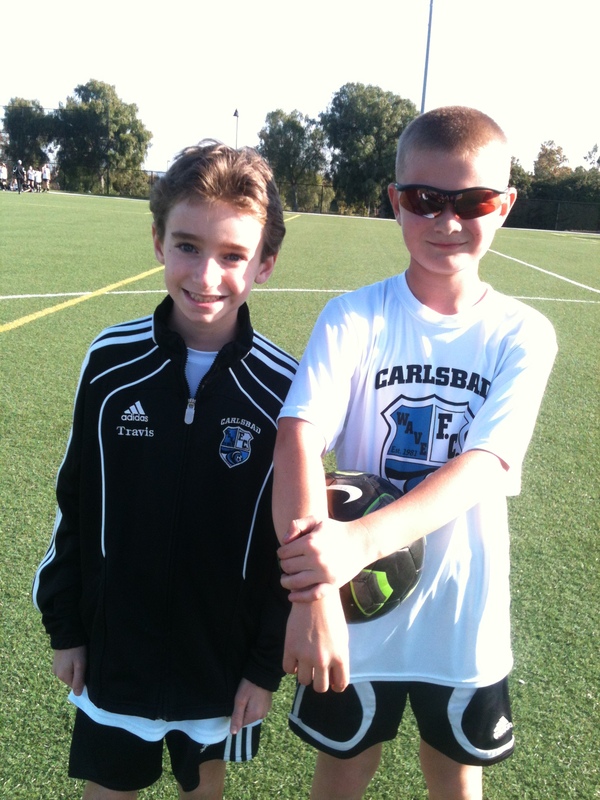 When he got there, Christian’s parents, Juli and Kirk, had arranged to have the Camp Pendleton Men’s Soccer Team players and coaches sign a jersey and Juli presented it to him. Very cool and positive messages from Travis’ fellow Warriors. Also, KC and his family, Jennifer and Michael, gave Travis a thoughtful gift bag that will help him pass the time. It looks like he will have some movie nights in his near future. Thanks guys (including Matthew, Brad, Christy and Steve)! Then to top things off, he was able to “carefully” kick the ball around for a while. Don’t worry mom…more physical therapy! When we arrived at home, we found a great meal prepared by the Young family. Thank you so much! We have been very blessed to have such great support from everyone.